For other uses, see Cavitation (disambiguation). Cavitating propeller model in a water tunnel experiment. High-speed jet of fluid impact on a fixed surface. Cavitation damage on a valve plate for an axial piston hydraulic pump. This video shows cavitation in a gear pump. Cavitation is a phenomenon in which rapid changes of pressure in a liquid lead to the formation of small vapor-filled cavities, in places where the pressure is relatively low. When subjected to higher pressure, these cavities, called "bubbles" or "voids", collapse and can generate an intense shock wave. Cavitation is a significant cause of wear in some engineering contexts. Collapsing voids that implode near to a metal surface cause cyclic stress through repeated implosion. This results in surface fatigue of the metal causing a type of wear also called "cavitation". The most common examples of this kind of wear are to pump impellers, and bends where a sudden change in the direction of liquid occurs. Cavitation is usually divided into two classes of behavior: inertial (or transient) cavitation and non-inertial cavitation. The process in which a void or bubble in a liquid rapidly collapses, producing a shock wave, is called inertial cavitation. Inertial cavitation occurs in nature in the strikes of mantis shrimps and pistol shrimps, as well as in the vascular tissues of plants. In man-made objects, it can occur in control valves, pumps, propellers and impellers. Non-inertial cavitation is the process in which a bubble in a fluid is forced to oscillate in size or shape due to some form of energy input, such as an acoustic field. Such cavitation is often employed in ultrasonic cleaning baths and can also be observed in pumps, propellers, etc. Since the shock waves formed by collapse of the voids are strong enough to cause significant damage to moving parts, cavitation is usually an undesirable phenomenon. It is very often specifically avoided in the design of machines such as turbines or propellers, and eliminating cavitation is a major field in the study of fluid dynamics. However, it is sometimes useful and does not cause damage when the bubbles collapse away from machinery, such as in supercavitation. Inertial cavitation was first observed in the late 19th century, considering the collapse of a spherical void within a liquid. When a volume of liquid is subjected to a sufficiently low pressure, it may rupture and form a cavity. This phenomenon is coined cavitation inception and may occur behind the blade of a rapidly rotating propeller or on any surface vibrating in the liquid with sufficient amplitude and acceleration. A fast-flowing river can cause cavitation on rock surfaces, particularly when there is a drop-off, such as on a waterfall. Other ways of generating cavitation voids involve the local deposition of energy, such as an intense focused laser pulse (optic cavitation) or with an electrical discharge through a spark. Vapor gases evaporate into the cavity from the surrounding medium; thus, the cavity is not a perfect vacuum, but has a relatively low gas pressure. Such a low-pressure bubble in a liquid begins to collapse due to the higher pressure of the surrounding medium. As the bubble collapses, the pressure and temperature of the vapor within increases. The bubble eventually collapses to a minute fraction of its original size, at which point the gas within dissipates into the surrounding liquid via a rather violent mechanism which releases a significant amount of energy in the form of an acoustic shock wave and as visible light. At the point of total collapse, the temperature of the vapor within the bubble may be several thousand kelvin, and the pressure several hundred atmospheres. Inertial cavitation can also occur in the presence of an acoustic field. Microscopic gas bubbles that are generally present in a liquid will be forced to oscillate due to an applied acoustic field. If the acoustic intensity is sufficiently high, the bubbles will first grow in size and then rapidly collapse. Hence, inertial cavitation can occur even if the rarefaction in the liquid is insufficient for a Rayleigh-like void to occur. High-power ultrasonics usually utilize the inertial cavitation of microscopic vacuum bubbles for treatment of surfaces, liquids, and slurries. The physical process of cavitation inception is similar to boiling. The major difference between the two is the thermodynamic paths that precede the formation of the vapor. Boiling occurs when the local temperature of the liquid reaches the saturation temperature, and further heat is supplied to allow the liquid to sufficiently phase change into a gas. Cavitation inception occurs when the local pressure falls sufficiently far below the saturated vapor pressure, a value given by the tensile strength of the liquid at a certain temperature. In order for cavitation inception to occur, the cavitation "bubbles" generally need a surface on which they can nucleate. This surface can be provided by the sides of a container, by impurities in the liquid, or by small undissolved microbubbles within the liquid. It is generally accepted that hydrophobic surfaces stabilize small bubbles. These pre-existing bubbles start to grow unbounded when they are exposed to a pressure below the threshold pressure, termed Blake's threshold. The vapor pressure here differs from the meteorological definition of vapor pressure, which describes the partial pressure of water in the atmosphere at some value less than 100% saturation. Vapor pressure as relating to cavitation refers to the vapor pressure in equilibrium conditions and can therefore be more accurately defined as the equilibrium (or saturated) vapor pressure. Non-inertial cavitation is the process in which small bubbles in a liquid are forced to oscillate in the presence of an acoustic field, when the intensity of the acoustic field is insufficient to cause total bubble collapse. This form of cavitation causes significantly less erosion than inertial cavitation, and is often used for the cleaning of delicate materials, such as silicon wafers. Hydrodynamic cavitation describes the process of vaporisation, bubble generation and bubble implosion which occurs in a flowing liquid as a result of a decrease and subsequent increase in local pressure. Cavitation will only occur if the local pressure declines to some point below the saturated vapor pressure of the liquid and subsequent recovery above the vapor pressure. If the recovery pressure is not above the vapor pressure then flashing is said to have occurred. In pipe systems, cavitation typically occurs either as the result of an increase in the kinetic energy (through an area constriction) or an increase in the pipe elevation. Hydrodynamic cavitation can be produced by passing a liquid through a constricted channel at a specific flow velocity or by mechanical rotation of an object through a liquid. In the case of the constricted channel and based on the specific (or unique) geometry of the system, the combination of pressure and kinetic energy can create the hydrodynamic cavitation cavern downstream of the local constriction generating high energy cavitation bubbles. The process of bubble generation, and the subsequent growth and collapse of the cavitation bubbles, results in very high energy densities and in very high local temperatures and local pressures at the surface of the bubbles for a very short time. The overall liquid medium environment, therefore, remains at ambient conditions. When uncontrolled, cavitation is damaging; by controlling the flow of the cavitation, however, the power can be harnessed and non-destructive. Controlled cavitation can be used to enhance chemical reactions or propagate certain unexpected reactions because free radicals are generated in the process due to disassociation of vapors trapped in the cavitating bubbles. Orifices and venturi are reported to be widely used for generating cavitation. A venturi has an inherent advantage over an orifice because of its smooth converging and diverging sections, such that it can generate a higher flow velocity at the throat for a given pressure drop across it. On the other hand, an orifice has an advantage that it can accommodate a greater number of holes (larger perimeter of holes) in a given cross sectional area of the pipe. The cavitation phenomenon can be controlled to enhance the performance of high-speed marine vessels and projectiles, as well as in material processing technologies, in medicine, etc. Controlling the cavitating flows in liquids can be achieved only by advancing the mathematical foundation of the cavitation processes. These processes are manifested in different ways, the most common ones and promising for control being bubble cavitation and supercavitation. The first exact classical solution should perhaps be credited to the well- known solution by H. Helmholtz in 1868. The earliest distinguished studies of academic type on the theory of a cavitating flow with free boundaries and supercavitation were published in the book Jets, wakes and cavities followed by Theory of jets of ideal fluid. Widely used in these books was the well-developed theory of conformal mappings of functions of a complex variable, allowing one to derive a large number of exact solutions of plane problems. Another venue combining the existing exact solutions with approximated and heuristic models was explored in the work Hydrodynamics of Flows with Free Boundaries that refined the applied calculation techniques based on the principle of cavity expansion independence, theory of pulsations and stability of elongated axisymmetric cavities, etc. and in Dimensionality and similarity methods in the problems of the hydromechanics of vessels. A natural continuation of these studies was recently presented in The Hydrodynamics of Cavitating Flows – an encyclopedic work encompassing all the best advances in this domain for the last three decades, and blending the classical methods of mathematical research with the modern capabilities of computer technologies. These include elaboration of nonlinear numerical methods of solving 3D cavitation problems, refinement of the known plane linear theories, development of asymptotic theories of axisymmetric and nearly axisymmetric flows, etc. As compared to the classical approaches, the new trend is characterized by expansion of the theory into the 3D flows. It also reflects a certain correlation with current works of an applied character on the hydrodynamics of supercavitating bodies. Hydrodynamic cavitation can also improve some industrial processes. For instance, cavitated corn slurry shows higher yields in ethanol production compared to uncavitated corn slurry in dry milling facilities. This is also used in the mineralization of bio-refractory compounds which otherwise would need extremely high temperature and pressure conditions since free radicals are generated in the process due to the dissociation of vapors trapped in the cavitating bubbles, which results in either the intensification of the chemical reaction or may even result in the propagation of certain reactions not possible under otherwise ambient conditions. In industry, cavitation is often used to homogenize, or mix and break down, suspended particles in a colloidal liquid compound such as paint mixtures or milk. Many industrial mixing machines are based upon this design principle. It is usually achieved through impeller design or by forcing the mixture through an annular opening that has a narrow entrance orifice with a much larger exit orifice. In the latter case, the drastic decrease in pressure as the liquid accelerates into a larger volume induces cavitation. This method can be controlled with hydraulic devices that control inlet orifice size, allowing for dynamic adjustment during the process, or modification for different substances. The surface of this type of mixing valve, against which surface the cavitation bubbles are driven causing their implosion, undergoes tremendous mechanical and thermal localized stress; they are therefore often constructed of super-hard or tough materials such as stainless steel, Stellite, or even polycrystalline diamond (PCD). Cavitating water purification devices have also been designed, in which the extreme conditions of cavitation can break down pollutants and organic molecules. Spectral analysis of light emitted in sonochemical reactions reveal chemical and plasma-based mechanisms of energy transfer. The light emitted from cavitation bubbles is termed sonoluminescence. Use of this technology has been tried successfully in alkali refining of vegetable oils. Hydrophobic chemicals are attracted underwater by cavitation as the pressure difference between the bubbles and the liquid water forces them to join together. This effect may assist in protein folding. Cavitation plays an important role for the destruction of kidney stones in shock wave lithotripsy. Currently, tests are being conducted as to whether cavitation can be used to transfer large molecules into biological cells (sonoporation). Nitrogen cavitation is a method used in research to lyse cell membranes while leaving organelles intact. Cavitation plays a key role in non-thermal, non-invasive fractionation of tissue for treatment of a variety of diseases and can be used to open the blood-brain barrier to increase uptake of neurological drugs in the brain. Cavitation also plays a role in HIFU, a thermal non-invasive treatment methodology for cancer. Ultrasound sometimes is used to increase bone formation, for instance in post-surgical applications. Ultrasound treatments or exposure can create cavitation that potentially may "result in a syndrome involving manifestations of nausea, headache, tinnitus, pain, dizziness, and fatigue.". It has been suggested that the sound of "cracking" knuckles derives from the collapse of cavitation in the synovial fluid within the joint. Movements that cause cracking expand the joint space, thus reducing pressure to the point of cavitation. It remains controversial whether this is associated with clinically significant joint injury such as osteoarthritis. Some physicians say that osteoarthritis is caused by cracking knuckles regularly, as this causes wear and tear and may cause the bone to weaken. The implication being that, it is not the "bubbles popping," but rather, the bones rubbing together, that causes osteoarthritis. In industrial cleaning applications, cavitation has sufficient power to overcome the particle-to-substrate adhesion forces, loosening contaminants. The threshold pressure required to initiate cavitation is a strong function of the pulse width and the power input. This method works by generating controlled acoustic cavitation in the cleaning fluid, picking up and carrying contaminant particles away so that they do not reattach to the material being cleaned. Cavitation has been applied to egg pasteurization. A hole-filled rotor produces cavitation bubbles, heating the liquid from within. Equipment surfaces stay cooler than the passing liquid, so eggs don't harden as they did on the hot surfaces of older equipment. The intensity of cavitation can be adjusted, making it possible to tune the process for minimum protein damage. Cavitation damage to a Francis turbine. Cavitation is, in many cases, an undesirable occurrence. In devices such as propellers and pumps, cavitation causes a great deal of noise, damage to components, vibrations, and a loss of efficiency. Cavitation has also become a concern in the renewable energy sector as it may occur on the blade surface of tidal stream turbines. When the cavitation bubbles collapse, they force energetic liquid into very small volumes, thereby creating spots of high temperature and emitting shock waves, the latter of which are a source of noise. The noise created by cavitation is a particular problem for military submarines, as it increases the chances of being detected by passive sonar. Although the collapse of a small cavity is a relatively low-energy event, highly localized collapses can erode metals, such as steel, over time. The pitting caused by the collapse of cavities produces great wear on components and can dramatically shorten a propeller's or pump's lifetime. After a surface is initially affected by cavitation, it tends to erode at an accelerating pace. The cavitation pits increase the turbulence of the fluid flow and create crevices that act as nucleation sites for additional cavitation bubbles. The pits also increase the components' surface area and leave behind residual stresses. This makes the surface more prone to stress corrosion. Major places where cavitation occurs are in pumps, on propellers, or at restrictions in a flowing liquid. As an impeller's (in a pump) or propeller's (as in the case of a ship or submarine) blades move through a fluid, low-pressure areas are formed as the fluid accelerates around and moves past the blades. The faster the blade moves, the lower the pressure can become around it. As it reaches vapor pressure, the fluid vaporizes and forms small bubbles of gas. This is cavitation. When the bubbles collapse later, they typically cause very strong local shock waves in the fluid, which may be audible and may even damage the blades. Suction cavitation occurs when the pump suction is under a low-pressure/high-vacuum condition where the liquid turns into a vapor at the eye of the pump impeller. This vapor is carried over to the discharge side of the pump, where it no longer sees vacuum and is compressed back into a liquid by the discharge pressure. This imploding action occurs violently and attacks the face of the impeller. An impeller that has been operating under a suction cavitation condition can have large chunks of material removed from its face or very small bits of material removed, causing the impeller to look spongelike. Both cases will cause premature failure of the pump, often due to bearing failure. Suction cavitation is often identified by a sound like gravel or marbles in the pump casing. Common causes of suction cavitation can include clogged filters, pipe blockage on the suction side, poor piping design, pump running too far right on the pump curve, or conditions not meeting NPSH (net positive suction head) requirements. In automotive applications, a clogged filter in a hydraulic system (power steering, power brakes) can cause suction cavitation making a noise that rises and falls in synch with engine RPM. It is fairly often a high pitched whine, like set of nylon gears not quite meshing correctly. Discharge cavitation occurs when the pump discharge pressure is extremely high, normally occurring in a pump that is running at less than 10% of its best efficiency point. The high discharge pressure causes the majority of the fluid to circulate inside the pump instead of being allowed to flow out the discharge. As the liquid flows around the impeller, it must pass through the small clearance between the impeller and the pump housing at extremely high flow velocity. This flow velocity causes a vacuum to develop at the housing wall (similar to what occurs in a venturi), which turns the liquid into a vapor. A pump that has been operating under these conditions shows premature wear of the impeller vane tips and the pump housing. In addition, due to the high pressure conditions, premature failure of the pump's mechanical seal and bearings can be expected. Under extreme conditions, this can break the impeller shaft. Discharge cavitation in joint fluid is thought to cause the popping sound produced by bone joint cracking, for example by deliberately cracking one's knuckles. Since all pumps require well-developed inlet flow to meet their potential, a pump may not perform or be as reliable as expected due to a faulty suction piping layout such as a close-coupled elbow on the inlet flange. When poorly developed flow enters the pump impeller, it strikes the vanes and is unable to follow the impeller passage. The liquid then separates from the vanes causing mechanical problems due to cavitation, vibration and performance problems due to turbulence and poor filling of the impeller. This results in premature seal, bearing and impeller failure, high maintenance costs, high power consumption, and less-than-specified head and/or flow. To have a well-developed flow pattern, pump manufacturer's manuals recommend about (10 diameters?) of straight pipe run upstream of the pump inlet flange. Unfortunately, piping designers and plant personnel must contend with space and equipment layout constraints and usually cannot comply with this recommendation. Instead, it is common to use an elbow close-coupled to the pump suction which creates a poorly developed flow pattern at the pump suction. With a double-suction pump tied to a close-coupled elbow, flow distribution to the impeller is poor and causes reliability and performance shortfalls. The elbow divides the flow unevenly with more channeled to the outside of the elbow. Consequently, one side of the double-suction impeller receives more flow at a higher flow velocity and pressure while the starved side receives a highly turbulent and potentially damaging flow. This degrades overall pump performance (delivered head, flow and power consumption) and causes axial imbalance which shortens seal, bearing and impeller life. To overcome cavitation: Increase suction pressure if possible. Decrease liquid temperature if possible. Throttle back on the discharge valve to decrease flow-rate. Vent gases off the pump casing. Cavitation can occur in control valves. If the actual pressure drop across the valve as defined by the upstream and downstream pressures in the system is greater than the sizing calculations allow, pressure drop flashing or cavitation may occur. The change from a liquid state to a vapor state results from the increase in flow velocity at or just downstream of the greatest flow restriction which is normally the valve port. To maintain a steady flow of liquid through a valve the flow velocity must be greatest at the vena contracta or the point where the cross sectional area is the smallest. This increase in flow velocity is accompanied by a substantial decrease in the fluid pressure which is partially recovered downstream as the area increases and flow velocity decreases. This pressure recovery is never completely to the level of the upstream pressure. If the pressure at the vena contracta drops below the vapor pressure of the fluid bubbles will form in the flow stream. If the pressure recovers after the valve to a pressure that is once again above the vapor pressure, then the vapor bubbles will collapse and cavitation will occur. When water flows over a dam spillway, the irregularities on the spillway surface will cause small areas of flow separation in a high-speed flow, and, in these regions, the pressure will be lowered. If the flow velocities are high enough the pressure may fall to below the local vapor pressure of the water and vapor bubbles will form. When these are carried downstream into a high pressure region the bubbles collapse giving rise to high pressures and possible cavitation damage. Experimental investigations show that the damage on concrete chute and tunnel spillways can start at clear water flow velocities of between 12 and 15 m/s, and, up to flow velocities of 20 m/s, it may be possible to protect the surface by streamlining the boundaries, improving the surface finishes or using resistant materials. When some air is present in the water the resulting mixture is compressible and this damps the high pressure caused by the bubble collapses. If the flow velocities near the spillway invert are sufficiently high, aerators (or aeration devices) must be introduced to prevent cavitation. Although these have been installed for some years, the mechanisms of air entrainment at the aerators and the slow movement of the air away from the spillway surface are still challenging. The spillway aeration device design is based upon a small deflection of the spillway bed (or sidewall) such as a ramp and offset to deflect the high flow velocity flow away from the spillway surface. In the cavity formed below the nappe, a local subpressure beneath the nappe is produced by which air is sucked into the flow. The complete design includes the deflection device (ramp, offset) and the air supply system. Some larger diesel engines suffer from cavitation due to high compression and undersized cylinder walls. Vibrations of the cylinder wall induce alternating low and high pressure in the coolant against the cylinder wall. The result is pitting of the cylinder wall, which will eventually let cooling fluid leak into the cylinder and combustion gases to leak into the coolant. It is possible to prevent this from happening with the use of chemical additives in the cooling fluid that form a protective layer on the cylinder wall. This layer will be exposed to the same cavitation, but rebuilds itself. Additionally a regulated overpressure in the cooling system (regulated and maintained by the coolant filler cap spring pressure) prevents the forming of cavitation. From about the 1980s, new designs of smaller gasoline engines also displayed cavitation phenomena. One answer to the need for smaller and lighter engines was a smaller coolant volume and a correspondingly higher coolant flow velocity. This gave rise to rapid changes in flow velocity and therefore rapid changes of static pressure in areas of high heat transfer. Where resulting vapor bubbles collapsed against a surface, they had the effect of first disrupting protective oxide layers (of cast aluminium materials) and then repeatedly damaging the newly formed surface, preventing the action of some types of corrosion inhibitor (such as silicate based inhibitors). A final problem was the effect that increased material temperature had on the relative electrochemical reactivity of the base metal and its alloying constituents. The result was deep pits that could form and penetrate the engine head in a matter of hours when the engine was running at high load and high speed. These effects could largely be avoided by the use of organic corrosion inhibitors or (preferably) by designing the engine head in such a way as to avoid certain cavitation inducing conditions. Some hypotheses relating to diamond formation posit a possible role for cavitation—namely cavitiation in the kimberlite pipes providing the extreme pressure needed to change pure carbon into the rare allotrope that is diamond. The loudest three sounds ever recorded, during the 1883 eruption of Krakatoa, are now understood as the bursts of three huge cavitation bubbles, each larger than the last, formed in the volcano's throat. Rising magma, filled with dissolved gasses and under immense pressure, encountered a different magma that compressed easily, allowing bubbles to grow and combine. There exist macroscopic white lamellae inside quartz and other minerals in the Bohemian Massif and even at another places in whole of the world like wavefronts generated by a meteorite impact according to the Rajlich's Hypothesis. The hypothetical wavefronts are composed of many microcavities. Their origin is seen in a physical phenomenon of ultrasonic cavitation, which is well known from the technical practice. Cavitation occurs in the xylem of vascular plants when the tension of water within the xylem exceeds atmospheric pressure. The sap vaporizes locally so that either the vessel elements or tracheids are filled with water vapor. Plants are able to repair cavitated xylem in a number of ways. For plants less than 50 cm tall, root pressure can be sufficient to redissolve the vapor. Larger plants direct solutes into the xylem via ray cells, or in tracheids, via osmosis through bordered pits. Solutes attract water, the pressure rises and vapor can redissolve. In some trees, the sound of the cavitation is audible, particularly in summer, when the rate of evapotranspiration is highest. Some deciduous trees have to shed leaves in the autumn partly because cavitation increases as temperatures decrease. Cavitation plays a fundamental role in spore dispersal mechanism of particular types of plants. Fern provides a clear example. Namely, the fern sporangium acts as a catapult. The opening phase is driven by water vaporization and by the resulting pressure decrease inside annulus cells (that is the charging phase of the catapult). When the negative pressure approximately reaches the value of 10 MPa, cavitation occurs. This rapid event triggers the spore dispersal due to the elastic energy released by the annulus structure (that is the discharging phase of the catapult). The initial spores acceleration is significantly high (up to fifth times than gravitational acceleration). Just as cavitation bubbles form on a fast-spinning boat propeller, they may also form on the tails and fins of aquatic animals. This primarily occurs near the surface of the ocean, where the ambient water pressure is low. Cavitation may limit the maximum swimming speed of powerful swimming animals like dolphins and tuna. Dolphins may have to restrict their speed because collapsing cavitation bubbles on their tail are painful. Tuna have bony fins without nerve endings and do not feel pain from cavitation. They are slowed down when cavitation bubbles create a vapor film around their fins. Lesions have been found on tuna that are consistent with cavitation damage. Some sea animals have found ways to use cavitation to their advantage when hunting prey. The pistol shrimp snaps a specialized claw to create cavitation, which can kill small fish. The mantis shrimp (of the smasher variety) uses cavitation as well in order to stun, smash open, or kill the shellfish that it feasts upon. Thresher sharks use 'tail slaps' to debilitate their small fish prey and cavitation bubbles have been seen rising from the apex of the tail arc. In the last half-decade, coastal erosion in the form of inertial cavitation has been generally accepted. Bubbles in an incoming wave are forced into cracks in the cliff being eroded. Varying pressure decompresses some vapor pockets which subsequently implode. The resulting pressure peaks can blast apart fractions of the rock. As early as 1754, the Swiss mathematician Leonard Euler (1707–1783) speculated about the possibility of cavitation. In 1859, the English mathematician William Henry Besant (1828–1917) published a solution to the problem of the dynamics of the collapse of a spherical cavity in a fluid, which had been presented by the Anglo-Irish mathematician George Stokes (1819–1903) as one the Cambridge [University] Senate-house problems and riders for the year 1847. In 1894, Irish fluid dynamicist Osborne Reynolds (1842–1912) studied the formation and collapse of vapor bubbles in boiling liquids and in constricted tubes. The term "cavitation" first appeared in 1895 in a paper by John Isaac Thornycroft (1843–1928) and Sydney Walker Barnaby (1855–1925), to whom it had been suggested by the British engineer Robert Edmund Froude (1846–1924), third son of the English hydrodynamicist William Froude (1810–1879). Thornycroft and Barnaby were the first researchers to observe cavitation on the back sides of propeller blades. In 1917, the British physicist Lord Rayleigh (1842–1919) extended Besant's work, publishing a mathematical model of cavitation in an incompressible fluid (ignoring surface tension and viscosity), in which he also determined the pressure in the fluid. 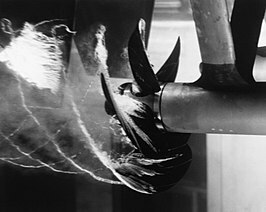 The mathematical models of cavitation which were developed by British engineer Stanley Smith Cook (1875–1952) and by Lord Rayleigh revealed that collapsing bubbles of vapor could generate very high pressures, which were capable of causing the damage that had been observed on ships' propellers. Experimental evidence of cavitation causing such high pressures was initially collected in 1952 by Mark Harrison (a fluid dynamicist and acoustician at the U.S. Navy's David Taylor Model Basin at Carderock, Maryland, USA) who used acoustic methods and in 1956 by Wernfried Güth (a physicist and acoustician of Göttigen University, Germany) who used optical Schlieren photography. In 1944, Soviet scientists Mark Iosifovich Kornfeld (1908–1993) and L. Suvorov of the Leningrad Physico-Technical Institute (now: the Ioffe Physical-Technical Institute of the Russian Academy of Sciences, St. Petersburg, Russia) proposed that during cavitation, bubbles in the vicinity of a solid surface do not collapse symmetrically; instead, a dimple forms on the bubble at a point opposite the solid surface and this dimple evolves into a jet of liquid. This jet of liquid causes the damage to solid surfaces. This hypothesis was supported in 1951 by theoretical studies by Maurice Rattray, Jr., a doctoral student at the California Institute of Technology. Kornfeld and Suvorov's hypothesis was confirmed experimentally in 1961 by Charles F. Naudé and Albert T. Ellis, fluid dynamicists at the California Institute of Technology. Supercavitation—This phenomenon is used to allow objects to travel under water at high speed. ^ Riesz, P.; Berdahl, D.; Christman, C.L. (1985). "Free radical generation by ultrasound in aqueous and nonaqueous solutions". Environmental Health Perspectives. 64: 233–252. doi:10.2307/3430013. JSTOR 3430013. PMC 1568618. PMID 3007091. ^ Brennen, Christopher. "Cavitation and Bubble Dynamics" (PDF). Oxford University Press. p. 21. Retrieved 27 February 2015. ^ Moholkar, Vijayanand S.; Pandit, Aniruddha B. (1997). "Bubble Behavior in Hydrodynamic Cavitation: Effect of Turbulence". AIChE Journal. 43 (6): 1641–1648. doi:10.1002/aic.690430628. ^ Birkhoff, G, Zarantonello. E (1957) Jets, wakes and cavities. New York: Academic Press. 406p. ^ Knapp, RT, Daili, JW, Hammit, FG (1970) Cavitation. New York: Mc Graw Hill Book Company. 578p. ^ Terentiev, A, Kirschner, I, Uhlman, J, (2011) The Hydrodynamics of Cavitating Flows. Backbone Publishing Company, 598pp. ^ Gogate, P. R.; Kabadi, A. M. (2009). "A review of applications of cavitation in biochemical engineering/biotechnology". Biochemical Engineering Journal. 44 (1): 60–72. doi:10.1016/j.bej.2008.10.006. ^ "Edible Oil Refining". Cavitation Technologies, Inc. Retrieved 2016-01-04. ^ "Sandia researchers solve mystery of attractive surfaces". Sandia National Laboratories. 2006-08-02. Retrieved 2007-10-17. ^ Pishchalnikov, Y. A; Sapozhnikov, O. A; Bailey, M. R; Williams Jr, J. C; Cleveland, R. O; Colonius, T; Crum, L. A; Evan, A. P; McAteer, J. A (2003). "Cavitation Bubble Cluster Activity in the Breakage of Kidney Stones by Lithotripter Shock Waves". Journal of Endourology. 17 (7): 435–446. doi:10.1089/089277903769013568. PMC 2442573. PMID 14565872. ^ University of Michigan. Therapeutic Ultrasound Group, Biomedical Engineering Department, University of Michigan. ^ Chu, Po-Chun; Chai, Wen-Yen; Tsai, Chih-Hung; Kang, Shih-Tsung; Yeh, Chih-Kuang; Liu, Hao-Li (2016). "Focused Ultrasound-Induced Blood-Brain Barrier Opening: Association with Mechanical Index and Cavitation Index Analyzed by Dynamic Contrast-Enhanced Magnetic-Resonance Imaging". Scientific Reports. 6: 33264. Bibcode:2016NatSR...633264C. doi:10.1038/srep33264. PMC 5024096. PMID 27630037. ^ Unsworth, A; Dowson, D; Wright, V (July 1971). "'Cracking joints'. A bioengineering study of cavitation in the metacarpophalangeal joint". Annals of the Rheumatic Diseases. 30 (4): 348–58. doi:10.1136/ard.30.4.348. PMC 1005793. PMID 5557778. ^ Deweber, K; Olszewski, M; Ortolano, R (Mar–Apr 2011). "Knuckle cracking and hand osteoarthritis". Journal of the American Board of Family Medicine : JABFM. 24 (2): 169–74. doi:10.3122/jabfm.2011.02.100156. PMID 21383216. ^ "How The Food Industry Uses Cavitation, The Ocean's Most Powerful Punch". NPR.org. Retrieved 2017-12-13. ^ Buckland H. C., Masters I.; Orme J. A. C., Baker T. (2013). "Cavitation inception and simulation in blade element momentum theory for modelling tidal stream turbines". Institution of Mechanical Engineers, Part A: Journal of Power and Energy. 227 (4): 479–485. doi:10.1177/0957650913477093. ^ Stachowiak, G.W. ; Batchelor, A.W. (2001). Engineering tribology. Engineering Tribology. p. 525. Bibcode:2005entr.book.....W. ISBN 978-0-7506-7304-4. ^ Inc., Triangle Pump Components. "Common Causes of Cavitation in Pumps". Retrieved 2018-07-16. ^ Golomb, Richard. "A new tailpipe design for GE frame-type gas turbines to substantially lower pressure losses". American Society of Mechanical Engineers. Retrieved 2 August 2012. ^ Vokart, P.; Rutschamnn, P. (1984). Rapid Flow in Spillway Chutes with and without Deflectors – A Model-Prototype Comparison, Proc. Intl. Symp. on Scale Effects in Modelling Hydraulic Structures, IAHR, Esslingen, Germany, H. KOBUS editor, paper 4.5. ^ Peterka, A.J. (1953). The Effect of Entrained Air on Cavitation Pitting." Joint Meeting Paper, IAHR/ASCE, Minneapolis, Minnesota, Aug. 1953, pp. 507–518. ^ Chanson, H. (1989). Study of Air Entrainment and Aeration Devices, Journal of Hydraulic Research, IAHR, Vol. 27, No. 3, pp. 301–319 (ISSN 0022-1686). ^ Chanson, H. (1989). Flow downstream of an Aerator. Aerator Spacing. Journal of Hydraulic Research, IAHR, Vol. 27, No. 4, pp. 519–536 (ISSN 0022-1686). ^ Chanson, H. (1994). Aeration and De-aeration at Bottom Aeration Devices on Spillways, Canadian Journal of Civil. Engineering, Vol. 21, No. 3, June, pp. 404–409 (ISSN 0315-1468). ^ Chanson, H. (1995). Predicting the Filling of Ventilated Cavities behind Spillway Aerators, Journal of Hydraulic Research, IAHR, Vol. 33, No. 3, pp. 361–372 (ISSN 0022-1686). ^ Program, Volcano Hazards. "Hawaiian Volcano Observatory". volcanoes.usgs.gov. Retrieved 2017-05-28. ^ 1944-, Rajlich, Petr (2007-01-01). Český kráter. Jihočeské muzeum. ISBN 9788086260808. OCLC 276814811. ^ 1944-., Rajlich, Petr (2014-01-01). Vesmírná příhoda v Českém křemeni (a v Českém masivu). Geologie. ISBN 9788026056782. OCLC 883371161. ^ Mestan, J.; Alvarez Polanco, E. I. (2014-12-01). "Density Variations in Quartz As a Key for Deciphering Impact-Related Ultrasonic Sounding (Rajlich's Hypothesis)?". AGU Fall Meeting Abstracts. 11: MR11A–4310. Bibcode:2014AGUFMMR11A4310M. ^ Sperry, J.S., Saliendra, N.Z., Pockman, W.T., Cochard, H., Cuizat, P., Davis, S.D., Ewers, F.W., & Tyree, M.T., 1996. New evidence for large negative xylem pressures and their measurement by the pressure chamber technique. 'Plant Cell Environ.' 19: 427–436. ^ Noblin, X.; Rojas, N. O.; Westbrook, J.; Llorens, C.; Argentina, M.; Dumais, J. (2012). "The Fern Sporangium: A Unique Catapult". Science. 335 (6074): 1322–1322. doi:10.1126/science.1215985. ISSN 0036-8075. ^ Brahic, Catherine (2008-03-28). "Dolphins swim so fast it hurts". New Scientist. Retrieved 2008-03-31. ^ Iosilevskii, G; Weihs, D (2008). "Speed limits on swimming of fishes and cetaceans". Journal of the Royal Society Interface. 5 (20): 329–338. doi:10.1098/rsif.2007.1073. ISSN 1742-5689. PMC 2607394. PMID 17580289. ^ Patek, Sheila. "Sheila Patek clocks the fastest animals". TED. Retrieved 18 February 2011. ^ Tsikliras, Athanassios C.; Oliver, Simon P.; Turner, John R.; Gann, Klemens; Silvosa, Medel; D'Urban Jackson, Tim (2013). "Thresher Sharks Use Tail-Slaps as a Hunting Strategy". PLoS ONE. 8 (7): e67380. Bibcode:2013PLoSO...867380O. doi:10.1371/journal.pone.0067380. ISSN 1932-6203. PMC 3707734. PMID 23874415. ^ Panizza, Mario (1996). Environmental Geomorphology. Amsterdam; New York: Elsevier. pp. 112–115. ISBN 978-0-444-89830-2. ^ Besant, W. H. (1859). A Treatise on Hydrostatics and Hydrodynamics. Cambridge, England: Deighton, Bell, and Co. pp. 170–171. ^ (University of Cambridge) (1847). "The Senate-house Examination for Degrees in Honors, 1847.". The Examinations for the Degree of Bachelor of Arts, Cambridge, January 1847. London, England: George Bell. p. 13, problem 23. ^ (Cravotto & Cintas, 2012), p. 26. Reynolds, Osborne (1894). "Experiments showing the boiling of water in an open tube at ordinary temperatures". Report of the Sixty-fourth Meeting of the British Association for the Advancement of Science Held at Oxford in August 1894: 564. Reynolds, Osborne (1901). "Experiments showing the boiling of water in an open tube at ordinary temperatures". Papers on Mechanical and Physical Subjects. vol. 2. Cambridge, England: Cambridge University Press. pp. 578–587. ^ Thornycroft, John Isaac; Barnaby, Sydney Walker (1895). "Torpedo-boat destroyers". Minutes of the Proceedings of the Institution of Civil Engineers. 122 (1895): 51–69. doi:10.1680/imotp.1895.19693. From p. 67: " "Cavitation," as Mr. Froude has suggested to the Authors that the phenomenon should be called, … "
^ Cravotto, Giancarlo; Cintas, Pedro (2012). "Chapter 2. Introduction to sonochemistry: A historical and conceptual overview". In Chen, Dong; Sharma, Sanjay K.; Mudhoo, Ackmez (eds.). Handbook on Applications of Ultrasound: Sonochemistry for Sustainability. Boca Raton, Florida, USA: CRC Press. p. 27. ^ Dryden, Hugh L.; Murnaghan, Francis D.; Bateman, H. (1932). "Report of the Committee on Hydrodynamics. Division of Physical Sciences. National Research Council". Bulletin of the National Research Council (84): 139. ^ Rayleigh (1917). "On the pressure developed in a liquid during the collapse of a spherical cavity". Philosophical Magazine. 6th series. 34: 94–98. ^ See, for example, (Rayleigh, 1917), p. 98, where, if P is the hydrostatic pressure at infinity, then a collapsing vapor bubble could generate a pressure as high as 1260×P. "Erosion of propellers." Propeller Sub-Committee (Section III). Report of the Board of Invention and Research (September 17, 1917) London, England. Parsons, Charles A.; Cook, Stanley S. (1919). "Investigations into the causes of corrosion or erosion of propellers". Transactions of the Institution of Naval Architects. 61: 223–247. Parsons, Charles A.; Cook, Stanley S. (18 April 1919). "Investigations into the causes of corrosion or erosion of propellers". Engineering. 107: 515–519. Gibb, Claude (November 1952). "Stanley Smith Cook. 1875-1952". Obituary Notices of Fellows of the Royal Society. 8 (21): 118–127. doi:10.1098/rsbm.1952.0008. ; see pp. 123–124. ^ Harrison, Mark (1952). "An experimental study of single bubble cavitation noise". Journal of the Acoustical Society of America. 24 (6): 776–782. Bibcode:1952ASAJ...24..776H. doi:10.1121/1.1906978. ^ Güth, Wernfried (1956). "Entstehung der Stoßwellen bei der Kavitation" [Origin of shock waves during cavitation]. Acustica (in German). 6: 526–531. ^ Krehl, Peter O. K. (2009). History of Shock Waves, Explosions and Impact: A Chronological and Biographical Reference. Berlin and Heidelberg, Germany: Springer Verlag. p. 461. ISBN 9783540304210. ^ Kornfeld, M.; Suvorov, L. (1944). "On the destructive action of cavitation". Journal of Applied Physics. 15 (6): 495–506. Bibcode:1944JAP....15..495K. doi:10.1063/1.1707461. ^ Rattray, Maurice, Jr. (1951) Perturbation effects in cavitation bubble dynamics. Ph.D. thesis, California Institute of Technology (Pasadena, California, USA). ^ Naudé, Charles F.; Ellis, Albert T. (1961). "On the mechanism of cavitation damage by nonhemispherical cavities in contact with a solid boundary". Journal of Basic Engineering. 83 (4): 648–656. doi:10.1115/1.3662286. Available at: California Institute of Technology (Pasadena, California, USA). For cavitation in plants, see Plant Physiology by Taiz and Zeiger. Kornfelt, M. (1944). "On the destructive action of cavitation". Journal of Applied Physics. 15 (6): 495–506. Bibcode:1944JAP....15..495K. doi:10.1063/1.1707461. Barnett, S. (1998). "Nonthermal issues: Cavitation—Its nature, detection and measurement;". Ultrasound in Medicine & Biology. 24: S11–S21. doi:10.1016/s0301-5629(98)00074-x. For Cavitation on tidal stream turbines, see Buckland, Hannah C; Masters, Ian; Orme, James AC; Baker, Tim (2013). "Cavitation inception and simulation in blade element momentum theory for modelling tidal stream turbines". Proceedings of the Institution of Mechanical Engineers, Part A: Journal of Power and Energy. 227 (4): 479. doi:10.1177/0957650913477093. Look up cavitation in Wiktionary, the free dictionary. Wikimedia Commons has media related to Cavitation.